It may sound strange but scientists are generating evidence to show that the solution to eliminating dengue lies in breeding mosquitoes that are incapable of transmitting dengue, and possibly chikungunya and even Zika. Several research groups globally are engaged in developing new vaccines, drugs and are even breeding genetically modified (GM) mosquitoes to combat dengue, but with little success. The approach developed by scientists at Monash University in Melbourne is radically different. It involves using a naturally occurring bacteria called Wolbachia, which, when present in Aedes aegypti mosquito, reduces its ability to transmit dengue. Wolbachia is rather ubiquitous bacteria – present in 60 per cent of 5 million insect species, but strangely not in Aedes aegypti mosquito which harbours and transmits dengue virus. Scientists have transferred Wolbachia (extracted from fruit flies) into Aedes aegypti – not by any genetic engineering but by injecting it into mosquito eggs and then breeding such mosquito lines. They have shown that Wolbachia-carrying mosquitoes don’t transmit dengue because the dengue virus can’t replicate itself due to Wolbachia. And if enough number of such mosquitoes multiply in the environment, dengue transmission in a given area can possibly be halted. The approach has generated huge interest in dengue-endemic countries, including India. Earlier this year, the Indian Council of Medical Research (ICMR) signed an agreement with Monash University to work on the new approach in India. Research is on at the Pondicherry-based Vector Control Research Centre (VCRC) and if it proceeds as planned, the first trial of Wolbachia-carrying mosquitoes could begin in India as early as 2018. Field trials are on since 2011 in Australia, Vietnam, Indonesia, Brazil and Colombia. “We seed wild mosquito populations with Wolbachia in areas where dengue is endemic. This is done through controlled releases of Wolbachia-carrying mosquitoes that then breed with wild mosquitoes. Our prediction is that if Wolbachia – which is passed on from one generation to another through insect’s eggs - can establish in wild mosquito populations in an area then it reduces transmission of dengue among humans,” Prof Scott O’Neill, director of the Institute of Vector-borne Diseases at Monash University. The studies so far have shown that the method can be deployed successfully and that Wolbachia can sustain itself in mosquito populations without any need for continued replenishment. “We are now developing methods for low-cost, large-scale application across urban areas. Our first city-wide trial began in 2014 in northern Australia and we hope to undertake further large-scale trials in Indonesia and Brazil,” said Prof O’Neill. A key objective of trials in large areas is to directly measure reduction in dengue following the release and availability of Wolbachia-carrying mosquitoes in a city. Wolbachia is safe to humans, animals and the environment, scientists say. “It is safe to humans because Wolbachia is already in our food chain, and it is commonly found in fruit flies, butterflies, moths and species of mosquitoes other than Aedes aegypti. Second, our approach does not alter naturally occurring population profile of mosquitoes, so there is no fear of other vectors replacing mosquitoes,” he added. Safety and risk assessment studies conducted by the Commonwealth Scientific and Industrial Research Organisation (CSIRO) of Australia have not found any risk. Wolbachia can’t be passed to humans and other mammals. 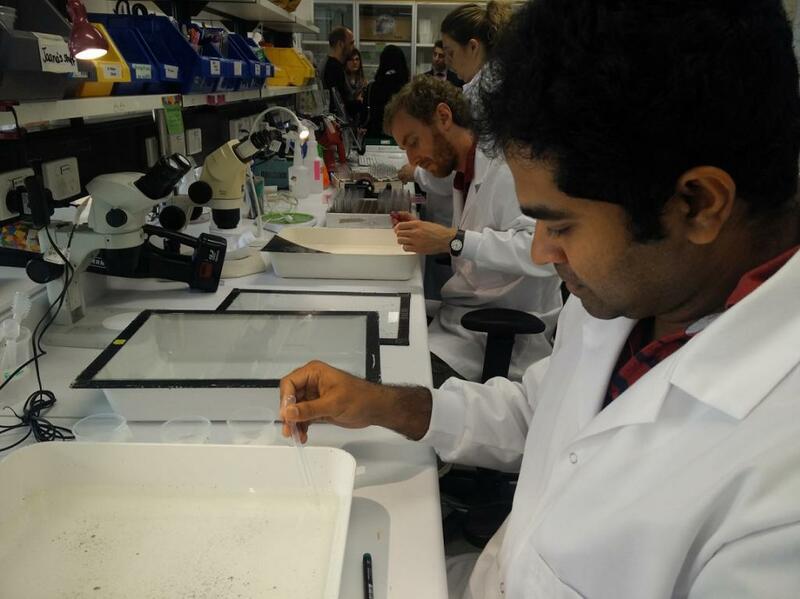 In the Monash lab, volunteers let caged Wolbachia-carrying mosquitoes bite them for 15 minutes periodically, and they have now shown any sign of Wolbachia or antibodies in their blood. At VCRC in Pondicherry, research is focused on developing a local Aedes aegypti strain carrying Wolbachia by a series of backcrossing experiments involving Australian strain, wMel Aedes aegypti, and local wild Aedes aegypti strains. “Laboratory experiments will be carried out to confirm that our strain carries all the properties (with respect to maternal inheritance, incompatibility and resistance to local dengue and chikungunya viral strains) of the Australian strain,” explained Dr Jambulingam Purushothaman, director, VCRC. Once this is done, a laboratory cage experiment will be carried out to test the ability of resultant strain to replace local Aedes aegypti mosquito. “This is a proof-of concept experiment and by the end of the study we would have characterized local strain of Aedes aegypti carrying Wolbachia and standardized methods for its mass rearing,” he added. Pilot scale trials could begin sometime in 2018. The Wolbachia approach is different in many ways from GM mosquito approach – which is also being experimented in India. GM mosquitoes are supposed to suppress Aedes aegypti populations as genetically engineered male mosquitoes could render wild female mosquitoes unable to reproduce, and thus eliminate wild population. It requires release of huge numbers of GM mosquitoes and needs reapplication over time. On the other hand, Wolbachia approach does not tinker with population dynamics of wild mosquitoes and needs release of smaller number of male and female mosquitoes with Wolbachia. Over a period of time, the percentage of mosquitoes carrying Wolbachia increases and remains high without any further releases.